I met this fine-looking farmer when he was visiting the United States one particularly frigid week in February 2004. It was his second visit to the Twin Cities of the American Midwest, where I had been hunkering down in hibernation mode for the winter. He had come to visit a childhood mate who had moved to St. Paul, Minnesota after secondary school. It was only his second time in Minneapolis, the beloved city that I had recently returned to after a production stint an at Emmy award-winning television show in New York City. Prior to New York, I had spent a chunk of time living the hazy, surreal, set-life of Los Angeles. I loved the buzz of film sets and sound stages and just being a part of the team behind-the-scenes. I grew up an ambitious girl in small-town Wisco, and was always eager to break away to the bright lights of a big city. In Minneapolis, I had found balance working as a creative producer for an influential, (if somewhat Mad Men-esque) advertising agency, while traveling globally to execute broadcast television campaigns for international beauty and food brands. I lived comfortably in the middle of the picturesque city, and if I was going anywhere else, you could hedge your bets that it would be back to Brooklyn. On the evening we were introduced, I hadn’t fancied going out, but I was persuaded by a colleague who was desperate for a fun night after a long workweek. I wasn’t feeling terrific that day, so I prettied myself up as best as I could and got on with it, as you do when all you really want to do is lounge around in flannel pajamas and sip chamomile tea all evening. Before I knew it, my taxi arrived, and I mustered the energy to run out the door. We were having a laugh with friends at a newish downtown lounge when a handsome flaxen-haired fella breezed past our group, turned his head and shot us a smile. As he was waiting for his drink at the bar, my friend starting chatting with him. Or was she chatting him up? Either way, I could see that he was very polite and by the lilt in his voice, I noted that he was clearly not from the United States, though I couldn’t quite place his accent. After a casual introduction, I learned that this striking man with the unusual accent was named Richard McDonnell. And, judging from his fair-skinned, ginger-topped mates sipping pints of Guinness, I put two and two together and wielding some heavy-handed stereotypes guessed that they were all either from Ireland or perhaps the UK. The evening was becoming far more interesting than I had anticipated. Later, as the others trailed off in conversation and dance, Richard and I found ourselves at a table alone and began to get to know one another. He revealed that he lived on a farm in the Irish countryside that had been in his family since the 1800’s and that he had a university degree in philosophy. What a fascinating combination, I thought. 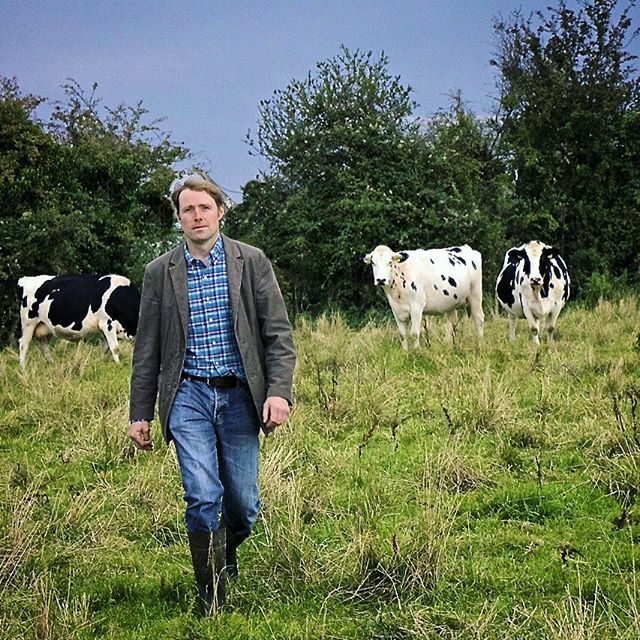 Kant, Hobbes, Plato had been impossible for me to get my head around in my university studies, and farming….well, I had never stepped foot on a real working farm in my life. He also shared that his star sign was Aquarius, as is mine. I warmed to him. Though I occasionally found it hard to understand his thick Irish brogue, he had no shortage of charming and funny quips, which kept me in stitches all evening long. At the end of the night, Richard said he would only be in town for a few more days and asked if I would join him for dinner the following evening. Somewhat reluctantly, I agreed. Despite enjoying our lively conversation, I was still not sure if I really wanted to see him again. I wasn’t keen on romance at the time. But, he said “think about it and choose your favorite restaurant,” and suddenly I was torn between fun visions of the best melt-in–your-mouth butterknife steak at kitsch and campy Murray’s or the only authentic spaghetti and meatballs in town washed down with goblets of Barolo at the quiet little trattoria in my neighborhood. We exchanged phone numbers and went our separate ways. Early the next morning, he texted me to say he was looking forward to our dinner. I panicked. Happily busy with a creative career that kept me constantly working and traveling, I had convinced myself that I had no time or energy to put into developing a rewarding relationship, or was I just simply nervous and unsure of myself? If I knew one thing, it was that I had no designs on dating a farmer from Ireland! Still, Richard was awfully attractive, intelligent, and quite charismatic, so despite my hang–ups, I agreed on the stipulation that my bubbly Aussie friend and her lovely husband would join us. After all, a girl can never be too careful, right? We met at a quaint new eatery that had been getting excellent reviews. Built into a historic neighborhood bakery, the space was intimate and filled to the brim with vintage bistro charm and personality. Looking in from the outside on a brisk winter’s evening you could see tables situated behind spacious steamed-up lead glass windows with enchanted looking people dining together in dim candlelight. The quiet sounds of Chet Baker could be heard under the commotion of lively dinner conversation, the atmosphere was romantic and convivial at once, the best sort of combination. Richard walked in, all refreshed, pressed and dressed, and I must confess, I felt a twinge of excitement in my tummy when our eyes met. I introduced him to my friends, and the conversation, laughter, and Burgundy flowed all night long. The food was sensational. We both ordered coq au vin, which was so rich and tender that I may have actually been able to eat it with a dessert spoon. For our final course, an unforgettable chocolate fondant with a lavender-laced molten center that took my breath away. I will never forget the perma-grin I was sporting from ear to ear all evening. At the end of the meal, Richard excused himself and discreetly paid the entire bill. Clearly chivalry was not dead to him, but I insisted on chipping in as well. Later that evening he told me that it was his birthday. I marveled at his level of modesty, as such information would have certainly been divulged during dinner had it been my birthday. I wondered, could he be for real? After we said goodnight, I turned the events of the evening in my head over and over. I came to the conclusion that being selfless and humble is absolutely alluring. Not all, but plenty of men that had previously come into my life were far more preoccupied with their own interests and never seemed to cease speaking in a certain style of egoistic banter; a personality trait that Richard McDonnell did not seem to possess. “why, my father, of course”. That romantic gesture launched over a year of transatlantic dating romance, the requisite meeting of the families, (my father gave his blessing the minute he realized I couldn’t stop “smiling like a Cheshire Cat” whenever we were together), and hopping around to holiday spots together as I traveled on production business overseas. Soon, we knew that we wanted to spend more time together on a permanent basis, which was a glorious notion, except this meant one of us would have to uproot and relocate. We were two people who had fallen hopelessly in love who had to make a choice, which wasn’t going to be easy. I knew that Richard wasn’t in a position to “relocate” his family farm, and my work was seemingly more flexible, but I couldn’t be sure. Finally, I decided brazenness could pay off; I took the risk and leaped! Over the years, I have come to the realisation that a farmer’s affinity for chocolate could quite simply be attributed to energy-craving exhaustion. Nevertheless, it is a family favorite so I decided early on that I would have to perfect a chocolate cake that the whole farm would love. 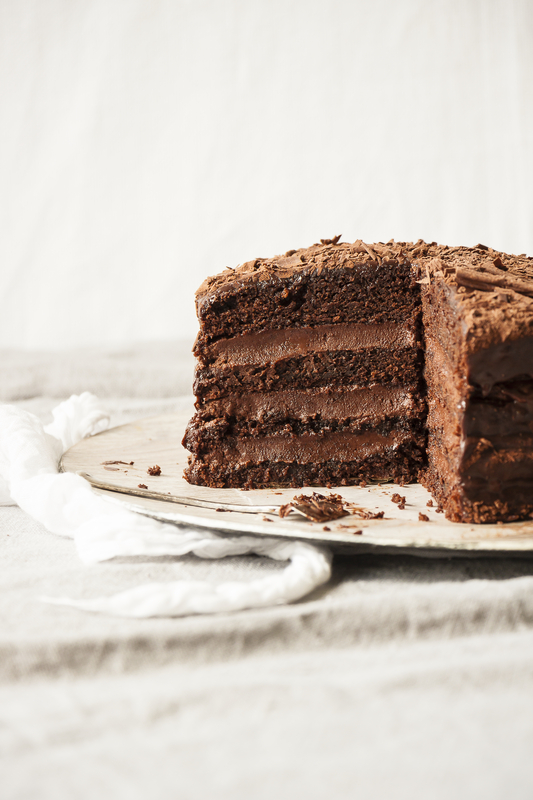 I wanted to create a creamy, mellow, super moist chocolate-y-but-not-overpoweringly-so chocolate layer cake. The test was on. I started with a sour cream chocolate cake, then tried crème fraîche, and even tried cream cheese. While a couple of those tasted very nice, not until I incorporated buttermilk did I discover the ideal formula. This is a rich, dense, somewhat tangy cake with a super-buttery chocolate buttercream icing and creamy deep chocolate ganache. It is well suited for chocolate loving family and friends, yet still a treat for those who claim they aren’t crazy for chocolate. Make this decadent cake for Valentine’s Day, I swear it is totally tastes like love. Unsweetened cocoa powder and confectioner’s sugar, to dust. Preheat oven to 350f/175c degrees. Grease and flour two 9-inch baking pans and line with parchment paper circles. Set aside. In the large bowl of a standing mixer fitted with a paddle attachment, mix together flour, sugar, cocoa, baking soda, and salt. Add eggs, buttermilk, melted butter and vanilla extract and beat until smooth (about 3 minutes). Remove bowl from mixer and stir in hot coffee. The batter will be runny. Divide batter evenly between the two pans and bake on middle rack of oven for about 35 minutes, until a toothpick inserted in center comes out clean. Allow to cool 15 minutes in pans, then run a butter knife around the edges of each cake. Pop out and allow to cool on wire cooling rack. Melt the chocolate in a bain marie or a heatproof bowl over a saucepan of hot water. Set aside to cool slightly. In a large mixing bowl, cream the butter in standing mixer for at least 10 minutes at high speed, until pale and fluffy. Add the egg yolks and confectioner’s sugar and beat vigorously for another 5 minutes. Once the butter mixture is thoroughly mixed, remove 2 tablespoons and stir it into the cooled, melted chocolate. Then slowly pour the melted chocolate down the side of the mixing bowl (to prevent egg mixture from scrambling) into the butter mixture and fold it in quickly and gently until fully combined and smooth. Once the cakes are cooled, you can start making the chocolate ganache. Put the chocolate in a large bowl. Heat the cream to boiling point, then pour it over the chocolate, and stir until it melts. Set aside to cool. With a hand mixer, beat the cooled chocolate cream until it barely forms soft peaks, making sure not to overbeat it, or it will become too stiff to spread. Split the cakes in half horizontally with a sharp serrated knife. Spread the chocolate filling onto each layer and sandwich the layers together. Frost the cake with the chocolate ganache and decorate with chocolate curls, if you wish. Slan Abhaile & Happy Valentine’s Day! 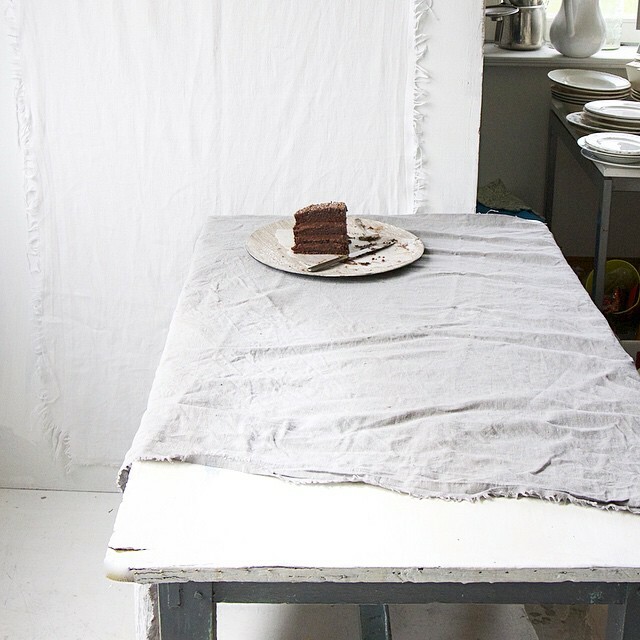 Cake & farm photos by Imen McDonnell, styling by Sonia Mulford-Chaverri. Easter is one of Ireland’s most notable holidays. There are so many special Irish traditions which have been celebrated at this time of year throughout history. Herring funerals, cake dances and the Cludog (in essence, the roasting of eggs on a farm) are all very old rituals that are not as widely in practice today, but are, nevertheless, nostalgic. Another practice that came as a bit of a surprise to learn was the observation of a ban on alcohol on Good Friday. Let’s just say, Easter is serious business around here. In our Irish-American blended home, we enjoy a mix of traditions. Richard loves the big chocolate eggs and we prepare gorgeous leg of local Irish spring lamb for Easter dinner which is a popular Irish Easter feast. Growing up stateside, we had the illustrious Easter Bunny whom, if we were good , our parents allowed to creep into our home in the dark of night to drop in a basket filled with Peeps, a fabulous chocolate bunny, tiny chocolate eggs and loads of other goodies. We would wake up in the morning to find a little note under the pillow, which was inscribed with a clue as to where to look for our eagerly awaited Easter Basket. One clue would lead to another, and another, and yet another, until we joyously discovered our Easter basket treasures! Another lovely Easter tradition in our home was dyeing eggs with little kits that were purchased at the local dime store. They included little round colourful tablets of dye (that someone inevitably always thought looked delicious), a wire egg holder for dipping and perhaps a crayon. You mixed the dye with vinegar, dipped the eggs and voila! Beautifully hued hard-boiled eggs. In the past, I’ve kept a stock of the PAAS colouring kits and have hosted Easter egg colouring parties here on the farm for my friends and their small children. The kids coloured their own tiny basket of eggs and then got to go out and milk feed the baby calves, always a treat!